This kit from B&H Photo pairs the blue Fujifilm instax mini 8 Instant Film Camera with two twin packs of instax mini Instant Color Film, giving you forty shots of film right out of the box. The camera features a Fujinon 60mm lens, a built-in flash, and automatic exposure control. An optical viewfinder with an integrated target spot helps with composition, and an exposure counter is incorporated into the design to visually display the number of exposures remaining in the film pack. Each pack of film provides ten 2.4 x 1.8" color glossy pictures with a white border. The film is daylight-balanced ISO 800 with high sharpness and vivid color reproduction. The mini credit-card sized format makes these images easy to carry, store, and share with friends. 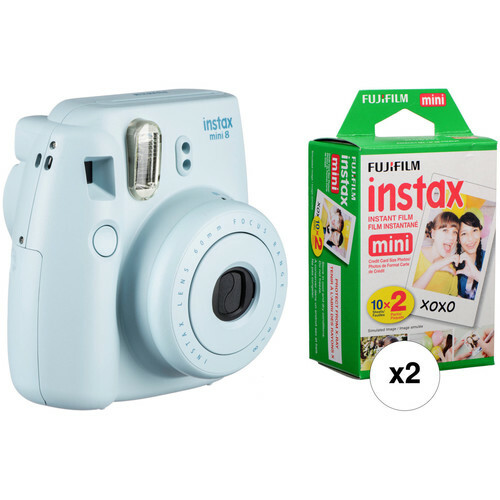 INSTAX Mini Instant Film (20 Exposures) is rated 4.8 out of 5 by 353. Rated 5 out of 5 by Anonymous from Great film I really like this film. The only downside is the size, and that there aren't more exposures. Unless I'm confused, I think it's 10 photos per roll, and it came with 2 rolls. I would have to recheck it. I do like how the film processed. It came out beautifully. Not too yellow or red like some other brands can come out. Since it's instant film, there's really no tinkering with how it develops, so I'm glad it came out the way it did. It feels like a vintage filter, kinda with a white overcast, but in a positive way. My photos are bright and clear. The photo size is smallish but I'm good with that. Really nice, I recommend this film. Rated 5 out of 5 by Lilli from nice pictures but expensive! It prints better picture than the 70's old fashion polaroid film. I like the cute size of it. The only thing i dont like is the price, its expensive!! Average cost per film is $cents to a $ depends on where you bought them. Because its expensive, there's no room for error in taking pictures. I have to be sure of my subject, angle and lighting before i take a picture unlike on my camera phone where i can take lots of pictures till i get the right one and i can even edit it! But with this film, i cannot afford to miss a great shot. The films are just so expensive. Hopefully they can make a cheaper kind of film that can still print good pics in the future. Rated 2 out of 5 by Anonymous from Hot and Cold Prints I was excited to start using this film for my daughter's birthday party. The price is fantastic, the delivery was short and got to me on time with days to spare. However, I have now used 4 films (40 prints) and in each pack, some photos come out completely black. I threw away the first few (3) , (total of 5 bad ones) because I was a bit upset and thought I was doing something wrong. Yeah, definitely not me. Perhaps I was just unlucky and received a semi bad batch? Whatever it is, in the end it didn't really help me save much and I gained annoyance. Rated 4 out of 5 by Lind-z from Good I bought this along with instax mini 8 camera. The film is a fun little size - about the size of business cards. The color of the film is great! When it first comes out of the camera the whole thing is white and then gradually the images shows up which is exciting and cool to see. I bought four of these packs. There was one pack that was missing two images as my camera said that there was still two shots left but when I hit the shutter release nothing came out. So that was disappointing as I was using this film as an instant memory book for someone on their special day. Rated 5 out of 5 by Morgan from Great for Value Film comes in two packages of ten shots each. Easy to use. It's much better to get the 20 exposure pack as compared to the 10 exposure pack just in terms of value. While this Instax film is not compatible, the Fujifilm FP-100C Professional Instant Color Film ISO 100 (10 Exposure, Glossy) B&amp;H # FUFP100CG is a compatible film. Does this work for Polaroid 300 Instant camera? Yes, this film is compatible with the Polaroid 300 instant camera. This film is compatible for use with the Fujifilm instax mini series of cameras. It will not work with an Older Polaroid Camera. For help identifying the right film for your particular camera feel free to email us directly at photo@bhphotovideo.com. When are you going to have stocks again??? Sorry, but we do not have a definite date of availability for this product. Please monitor the product page and request a stock alert if available. Hopefully it will be soon. Does this film need to be refrigerated? Will this film work in the old Polaroid Captiva slr? No, this is for the Instax polaroid camera. Should the film be hand-checked in airport security? Thanks. Yes. Instax films have an ISO rating of 800. This makes them much more sensitive to the x-rays used in airport security than other, less sensitive films. When preparing for a flight, take all of your sealed foil packets of film packs and place them in a clear zip-lock bag. When you are about to put your things through the x-ray scanner, politely ask a TSA agent if they will hand check your film. I've never been denied a request for a hand check for any film. If they question you though and they say that the x-ray shouldn't affect your film, politely remind them that the TSA's website informs travelers that they will hand check film of ISO 800 or higher. Remember to always be polite and respectful; it will make everything easier for you and them. NOTE: You can only request a hand check of packaged film; if you have a partially-used package of film inside your camera, you'll have to put the camera through the x-ray scanner. It's best to try to shoot the whole film pack before going through security so that you can put the camera through the scanner without film in it. Is the film white or is it colored?